Reminiscent of the great Mustang fighter planes, these spinning blades give the illusion of flight. 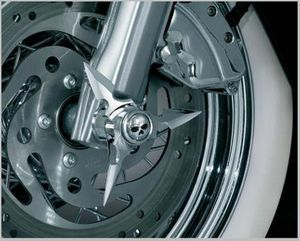 The chrome-plated ABS blades start to spin when the bike reaches about 25 mph. Choose either a pointed center cap or a Zombie center cap to add an additional cool factor to your bike.